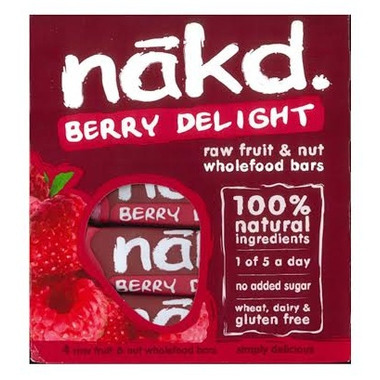 This Eat Nakd Berry Delight Raw Bar contains natural raspberry flavours, with real raspberries, dates, cashew nuts and raisins for an energy boost that’s natural and lasts. Its tantalising combination of fruits and nuts will keep tummies satisfied and deliver all sorts of lovely nutrients, straight from the hands of Mother Nature herself. Where other bars are baked, Berry delight bars are kept fresh and moist, and contain none of the sugary syrups added to most of the other cereal bars. Love these Nakd bars, but this is the best of them. When I crave that after dinner treat, I munch down one of these knowing I'm eating nuts, dates and fruit. Can't beat that. Way better for your children (and grown-ups) than most granola bars and of course candy bars. Kick the habit. Give it a try. Delicious! i loved it and so did my little one!! Great tasting bars. Love the ingredients. Love these bars. Perfect snack and satisfies my craving for something sweet. They taste like real raspberries! Also, really like that they are dairy, gluten and soy free! Love these bars and great deal for the price. Love the fact that they contain real raspberries, dates, cashew nuts and raisins for an energy boost thatâ€™s natural and lasts. A great go to snack when working out. Oh my goodness so good! I bought them for low glucose emergencies and ended up eating the whole box just cause they were so yummy! Great bar. Too small but extremely tasty. This one tastes better than the cocoa one.